This month is the last month to submit yourself, or any of your team mates to be an officer. Why? Well, you get to set the training dates, evaluation dates, and/or get to meet at exotic locations once a month for dinner and discussion. If you are interested in any position please look at the web page for your future job description. You may or may not actually get to determine the above mentioned dates, depending on what job you wish for. Also, you need to throw in your hat at the next meeting, which just happens to be when you are reading this, if you don't have web access. The upcoming December party/voting/meeting will be at Bob Baker's house. Dec, 15, Saturday, 6:00 pm. Maps will be at the November meeting. December Evaluation will be before the training. Why? Because of the pending holidays. Also, historically this eval has usually been cancelled due to lack of poeple to do a litter eval. That said, if you need it for this year, you need to rustle up some team mates. The last physical fitness item I'm going to bring up this year. New Mexico State Police Selection Process Test. The November pre-business meeting training will be a discussion on the art of fire making. The November training is on the 10th at Piedra Lisa SouthTrailhead. It is a navigation training and starts at 9:00AM. The December training is on the 16th at Chamisoso Canyon. It is a Litter Handling training and starts at 9:00AM. On December 8th and 9th, there will be a NMESC sponsored training. December 8th the training will begin at 9AM at the Los Vecinos Community Center. The training on the 8th is schedule to end around 3PM. Sunday the 9th, the training will be the Sandia or Manzano Mountains and begin at 8AM. The exact locations are still to be determined. The class schedule and other details can be found at the NMESC website. Attending either or both days will get you one training credit. If you are a Cibola SAR member with base access, please contact Tony G. if you would like to help out with this orientation meeting. This has been a great source of potential new members for the team. We are trying to get a few members that would be willing to help out with this weekly meeting. The more volunteers we get, the less frequently any one person will be needed to attend. Tuesday's, 9:30 - 11:00 approximate time window, with less than an hour typically needed. The next NMESC scheduled meeting is on December 8th. This date will most likely change to December 1st because of the Boot Camp scheduled on December 8th and 9th. It appears that reimbursement payments are flowing again from the State. If you have not received a payment from the State for a mission, please contact Sue Williams. You can find more information about the Boards actives in the NMESC Newsletter and NMESC Board Minutes. During a recent training event the Garmin eTrex Venture GPS I've had since 2002 (reviewed in a previous newsletter) flaked out on me -- it is no longer possible to turn it on or off by pressing the power button (I discovered this while it was on, and was only able to shut it off by removing the batteries). A normal person would look into getting it repaired by an authorized Garmin repair facility. A normal geek would open it up and try to fix it himself (I might still do this). But I chose instead to upgrade to a shiny new toy. I surfed over to gpscity.com and purchased a Garmin GPSMAP 60CSx. The GPSMAP 60CSx differs from the GPSMAP 60Cx only in that the CSx unit has an internal electronic compass and barometric altimeter, and costs about $40 more than the unit without those sensors. So most of what I have to say in this article will pertain to both units. The screen on the GPSMAP 60 is 1.5 inches wide and 2.2 inches tall, providing a crisp 160x240-pixel, 256 color display. This is a very readable display that can support maps of various types including topo maps sold by Garmin on DVD or in ready-to-use MicroSD memory cards. The unit includes both USB and serial ports --- an important thing to know if you have any interest in doing APRS with your hand-held GPS, as it is not possible to use a USB-only GPS in APRS applications without a computer. In USB mode it is possible to enable the device as a USB Mass Storage device so it appears as a removable disk to your computer --- this is a very convenient thing when you get to the point of making your own maps (a topic for a future minilesson, but see this neat web site for details if you can't wait). 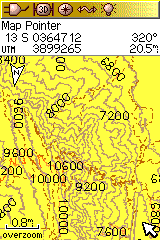 It is also essential for getting maps onto the unit if you don't have a Windows computer -- Garmin's MapSource program supports only Windows, so Macintosh or Linux users are not able to use that program to manage maps on the unit. The maps are stored on a removable MicroSD flash card --- a tiny thing that is smaller than my thumbnail. Garmin will sell you MicroSD cards pre-loaded with maps --- the only way to get Garmin maps if you don't do Windows. I was amazed at how quickly the unit acquired satellites. It had six satellite bars within seconds of my putting the batteries in --- while I was still standing in the kitchen in front of the freezer where I keep my battery stash. This is thanks to the high-sensitivity SIRFstar III 12-channel WAAS-enabled GPS module it contains. All of the controls are on the front of the unit except the power button, which is placed at the top of the unit in a spot where it can't accidentally be pressed. 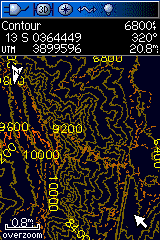 The controls include zoom in and zoom out buttons, a "find" button (for locating waypoints and points-of-interest by name or proximity), a Page button (for switching between the many views), a menu button, a Mark button (for marking waypoints or activating the Man OverBoard feature), an enter button and a "quit" button. The "quit" button is used to escape from menus, but also as a page button that cycles through pages in the opposite order of the Page button. There is also a four-position rocker switch for moving the map pointer, panning the map, or selecting from two-dimensional grids of menu items. The menu system is very well thought-out and intuitive, with all menu functions accessible through a main menu on one page. Menus specific to individual pages are also available while that page is visible, just by pressing the "menu" button. 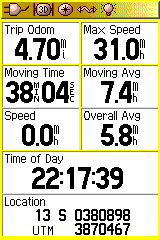 By default, the unit shows a satellite page, "trip computer" page, map page, navigation page, and altimeter page. You can customize the order in which they are rotated through by the page button, and add or remove pages from the cycle. The trip computer, map, and navigation pages are all customizable --- you can select which pieces of information are displayed in which box, and even how many boxes to display. Furthermore, the color scheme switches automatically from a bright scheme to a more subdued scheme after sunset. Both color schemes are customizable, and the automatic switching can be disabled --- this is important, as I find the "nighttime" color schems somewhat hard to read under bright lights, but much easier on the eyes in the dark. All data entry such as waypoint name and coordinates are done via a two-dimensional array of buttons, just like most of Garmin's recent products. If you are still using the old 12 series, you will definitely prefer this two-dimensional approach to the old way of cycling through the entire alphabet in a linear list. 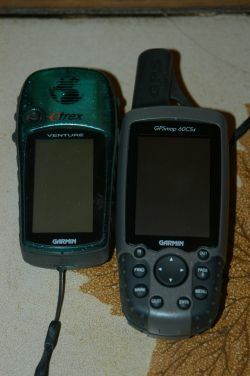 The GPSMAP 60 units are quite a bit larger than the eTrex, as you can see in the photo. This makes the 60CSx a little more inconvenient to carry around in your hand all the time, but not by much. The unit is also about two ounces heavier. Neither of these things seem to be significant disadvantages to me. Garmin sells topo maps for the unit in their "TOPO US" product. Fortunately, this product was out of stock when I bought my unit or I'd have impulse purchased the pre-loaded MicroSD card containing the entire region including NM, CO, AZ and UT, parts of WY, ID and TX. It was only after I caught my breath that I read the product details --- these maps are equivalent to the USGS 1:100,000 scale product, not the 1:24000 quads we use. Garmin only sells 1:24000 scale maps for the national parks, which doesn't help us much. I chose not to order the TOPO US product when it came in stock, as 1:100,000 scale maps are not detailed enough for SAR work. But others might choose to get it anyway --- a small-scale 1:100,000 map is better than nothing, and your only alternative to Garmin's maps is to roll your own or find a third party source of detailed topos. The topo maps you see in this article are home-grown topos of the Sandias that I generated myself from public-source geodata by following the procedures on Jack Luers' web site. And the biggest con has to be the price --- a unit with a color display, high-quality GPS receiver, and the electronic compass with barometric altimeter doesn't come cheap. The low-end eTrex is still around $90. A good vehicle GPS will set you back $800. The GPSMAP 60CSx is in the middle, at $350. Garmin is also currently running a $50 mail-in rebate program for both the 60 Cx and 60CSx --- the offer applies to units purchased before 31 December 2007. I've been enjoying my new toy since unwrapping it last week, and have even learned how to create maps for it. My wallet hurts a little bit, but not enough to make me regret the purchase. This is a very high-quality GPS with all the functions I need for SAR work, APRS geekery, geocaching, hiking, and other things I use my GPS for. My last GPS gave me five good years of heavy use, and if this one sticks with me for that long I'll be in good shape. I highly recommend the unit to anyone shopping for a quality mapping GPS for SAR work (with or without the compass and altimeter).